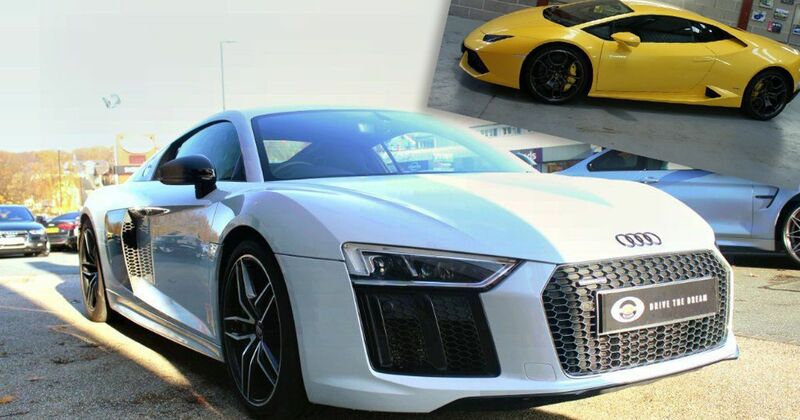 Down the years a lot of comparisons have been drawn between Audi’s R8 and Lamborghini’s junior supercars; first the Gallardo and now the Huracan. They are about the same size, built on a shared platform and use the same 5.2-litre V10 mounted behind a pair of seats. Not a V6 - the idea has been dropped. Depending on which side of the fence you stand, the R8 is either a cut-price Lamborghini or a supercar imposter, faking it in the face of genuinely exotic alternatives. We tend to say the former. The R8 drives so damn well that it’s impossible to criticise its supercar credentials from behind the wheel. So, for a very similar driving experience, albeit in a sensible Audi cabin rather than a slightly more characterful Lamborghini one, is the R8 a bit of a bargain? The cheapest we could find on Auto Trader in the UK was £84,990. White isn’t its best colour but the contrasting bodywork stands out a treat. 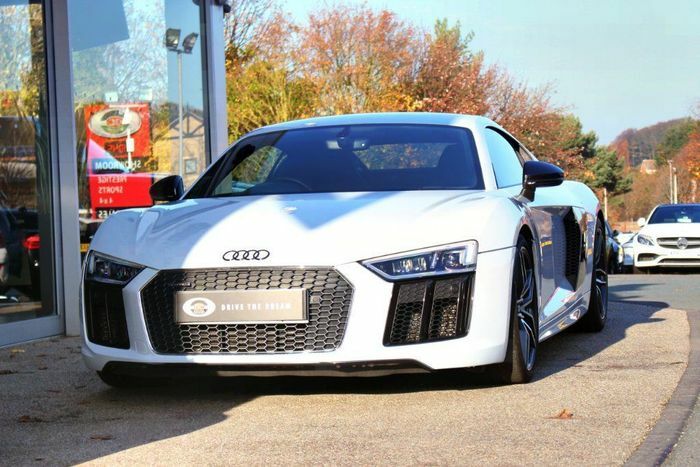 Fitted with the Sport Plus pack, the Sports Exhaust for maximum V10 howl, carbonfibre side blades and many more options, this 22,000-mile R8 coupe is every bit the junior supercar. Magnetic Ride has been spec’d, crucially, which transforms the all-round capability of the chassis. There’s very little not to love in this 2016 car from GC Motors in Harrogate. 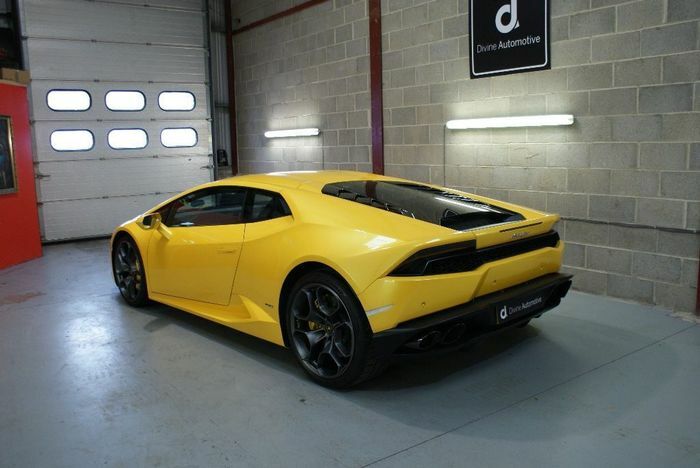 The alternative for this theoretical head-to-head is a Pearlescent Giallo Midas Huracan (sparkly goldy-yellow, then) from 2015; a year before the R8 here. The LP 610-4 uses the higher-tuned spec of the V10 engine, with the same 602bhp as the R8 V10 Plus – not the mere 533bhp stocked by the regular R8 V10 above. On the road you can feel the difference, but only if you don’t mind dancing with the law. The low-slung Huracan also rides on magnetorheological suspension, has a nose-lifter for speed bumps, sat-nav, swathes of Alcantara and this one even has a tracking device. There’s a glass engine cover because look at my V10, Dynamic Steering (booo) and something heinous called a Branding Package. We shudder to imagine how much that cost. The Huracan is arguably the slightly prettier of the two, but it’s horses for courses. It also has the way more exciting badge on the front, has done 12,000 miles – 10,000 miles less – and costs £139,995. 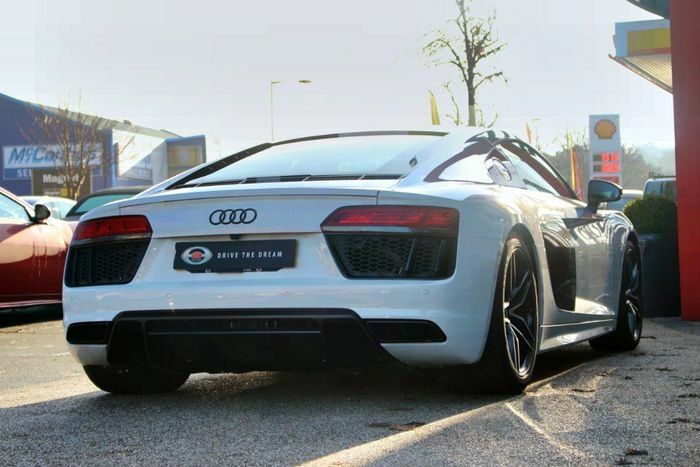 That’s £55,000 more than the R8. You could sacrifice 69bhp, get the R8 and with the change buy a lightly used RS 6 Avant as your practical everyday car. Not a bad two-car garage, that.